The sustainably built facility benefits the city-owned airport in many ways, notes Aviation Director Gary P. Mascaro. "We have now consolidated operations and maintenance at one location," he says. Previously, staff and equipment were spread among six separate buildings at the general aviation airport. 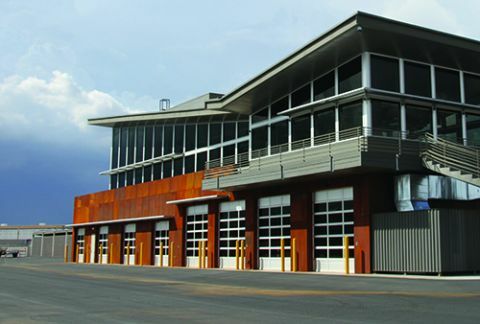 The two-story, 10,000-square-foot structure is steel-framed, with a rusted steel panel façade and bonderized metal siding. In addition to containing offices for SDL's 10-person operations staff, the new Ops Center houses numerous vehicles: a tractor, backhoe, sweeper, golf carts and tugs. The airport is especially proud of the facility's high environmental standards. Mascaro explains that the airport would have received gold-level LEED certification, but it didn't want to install solar panels due to the dangerous glare or reflections they could have created for pilots. "Not only is it a modern and sleek building, but it was designed to meet this high level of sustainable standards," notes Mascaro. Because the new building hasn't been occupied long, it is still too early to know how much electricity and water the airport will save. "Since all energy costs are now limited to only one building instead of six, I am certain that we will eventually see significant savings," says Mascaro. "We had one of the hottest summers here in many years, but tinted windows, roll shades and the modern, energy-efficient central air conditioning system have kept this building nice and cool," he adds. "Our operations people love it." Financing is another point of pride, as the entire $4.9 million project was designed and built with aviation enterprise funds. "Fortunately, we did not have to solicit funds from any outside agency," Mascaro says. "The money was already in our budget." Initial planning for the project started back in 2011, with the help of Coffman Associates, an airport planning company also based in Scottsdale. "Gary [Mascaro] first started discussing with us the need for a new Ops Center and his vision for a potential location. We were already under contract to the city of Scottsdale, so we worked with all the major stakeholders on this project for more than two years," says Jim Harris, the consulting firm's president. "One of our main responsibilities throughout all stages of the project was working closely with the FAA to ensure that the project complied with all FAA requirements and standards," Harris adds. "We revised the airport layout plan (ALP) to reflect the location of the proposed facility, and coordinated with the FAA to obtain the new ALP approval." Deciding where to locate the building proved to be a challenge. "There were height restrictions and setback requirements," explains Harris. "SDL is very compact, with a single runway. Based on input and direction from the airport's staff, we located the new building on an older parking lot, on the western side of the airport, right near the northern edge of the main apron." Coffman Associates also prepared the required FAA environmental documentation and obtained environmental approval for construction of the new facility. "This was an excellent example of a collaborative partnership between the airport, their consultants and the FAA, which resulted in a very successful project," says Harris. The new Ops Center is just one part of SDL's master plan, which was updated by Coffman Associates in 2015. Work is already underway on the airport's $27 million Terminal Area Redevelopment Plan. This project, which was recently approved by the Scottsdale City Council, will require demolition of the existing airport terminal building and aviation business center. In their place, the airport will add a modern office complex, redesigned restaurant and two executive hangars, all built to LEED standards for energy efficiency. Mascaro is excited about this project, and believes it will be a game-changer for SDL. "This is one of the largest, most unique developments I have seen for a general aviation airport of our size," he exclaims. Although airport staff will have to operate out of temporary quarters for several months, Mascaro is confident that the end result will be well worth the inconvenience. "This new project, when finished late next summer, will significantly improve our airport, and should meet the needs of our clients and pilots for many years to come," he predicts.